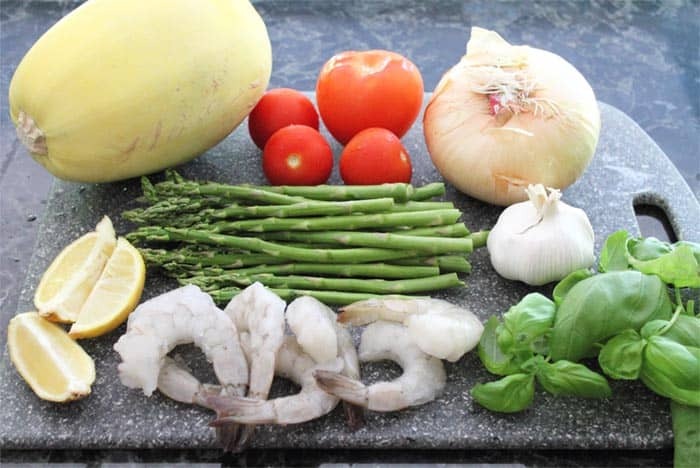 Light, refreshing Summer Shrimp Primavera is chock full of the freshest vegetables of the season, juicy low-fat shrimp and flavored with basil & a little lemon juice. 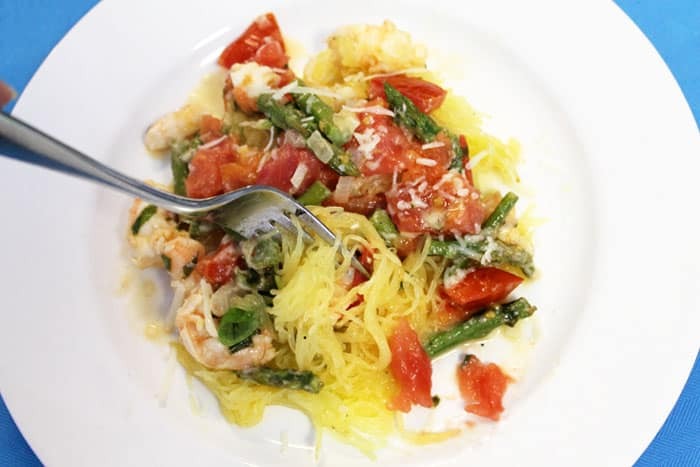 Toss it over spaghetti squash instead of pasta and it becomesthe perfect summertime dinner. Just the sound of Shrimp Primavera sounds healthy and delicious doesn’t it? 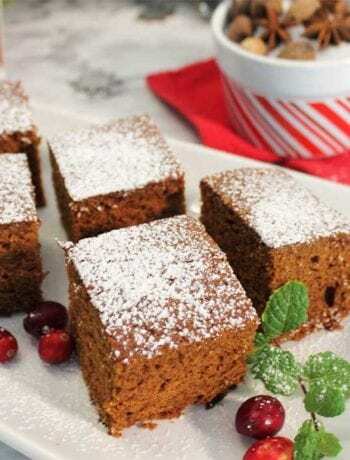 It seemed to fit our #RecipeMakeover week perfectly but the idea was to change up a well-loved recipe to make it less calorie laden. So I did! I upped the health quotient by subbing spaghetti squash for the regular pasta. And does it ever work well together! 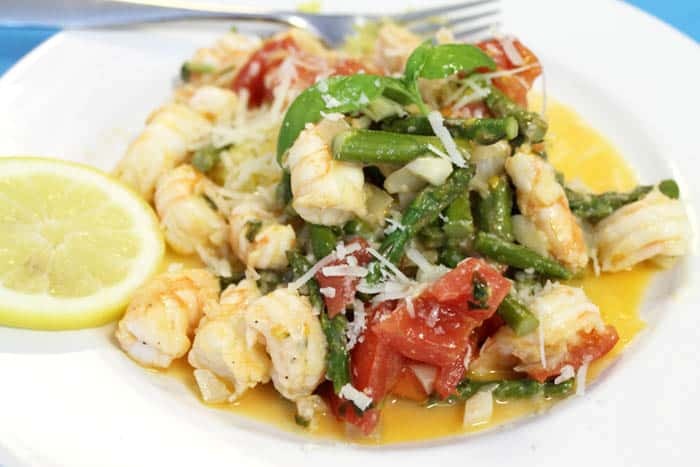 Delicious fresh tomatoes, basil and onions are paired with shrimp, asparagus and a little white wine to make a light, spectacular dish for summer enjoyment. 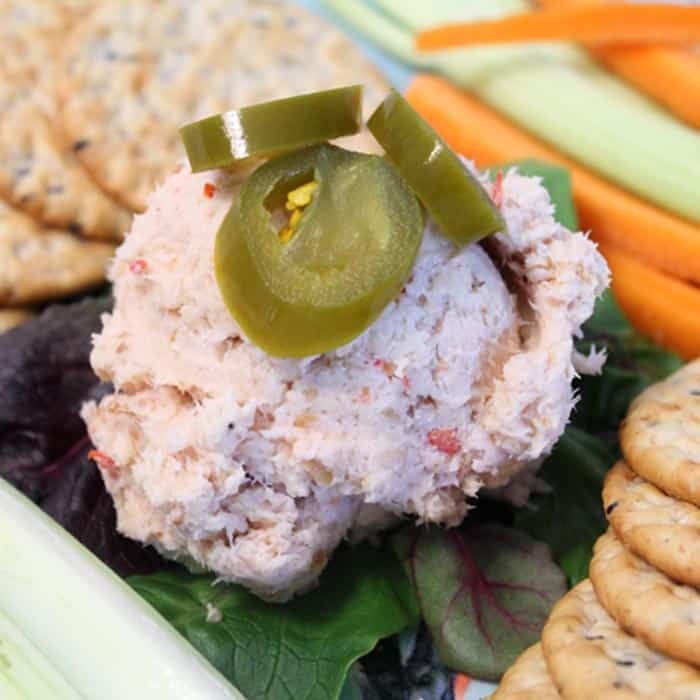 It’s easy to make and delicious enough to serve for company too. Slice the spaghetti squash in half. Spread some olive oil & seasoning over the cut side and place, cut side down, on cookie sheet. Bake at 375 for 40 minutes. Remove and let cool slightly then shred flesh with fork. Voila – instant spaghetti! See, I told you it was easy! The shrimp primavera part is even simpler. Just one large skillet, a little oil and less than 10 minutes cooking and it’s done. 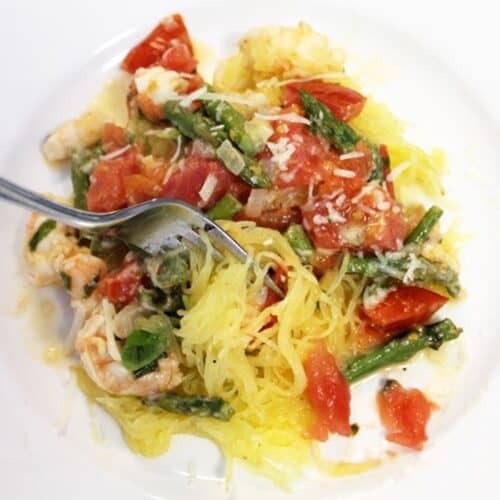 Top the spaghetti squash with the primavera mixture sprinkle with a little parmesan cheese and dig in. 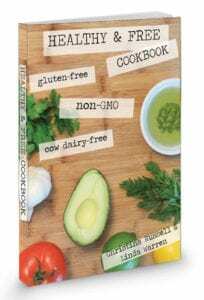 It tastes rich but no guilt here – it’s all good for you! 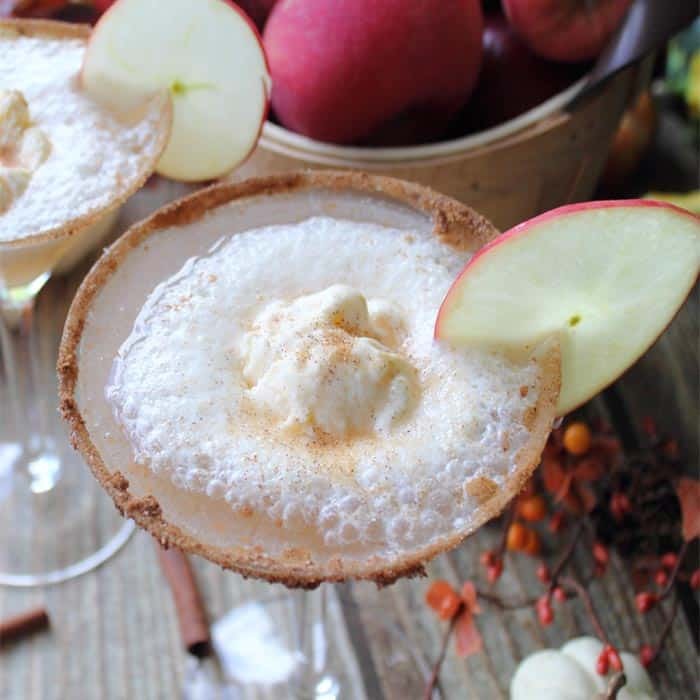 Enjoy this and other recipes from my fellow food bloggers below that are all part of our #RecipeMakeover week. 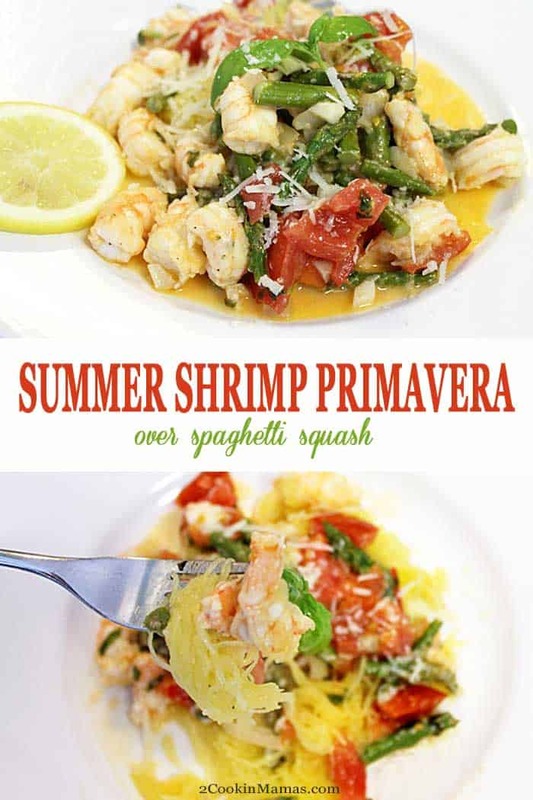 Light, refreshing Summer Shrimp Primavera is chock full of the freshest vegetables of the season, juicy low-fat shrimp and flavored with basil & a little lemon juice. Toss it over spaghetti squash instead of pasta and it becomes the perfect summertime dinner. Slice the spaghetti squash in half. Spread some olive oil & seasoning (salt & pepper) over the cut side and place, cut side down, on cookie sheet. Bake at 375 for 40 minutes. Remove and let cool slightly then shred flesh with fork. 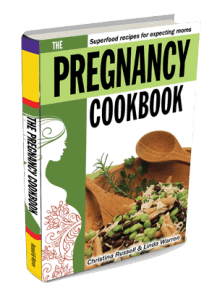 Place a small amount of olive oil into a large skillet. Heat over medium-high heat. Sauté onions for 2-4 minutes adding garlic for the last minute. 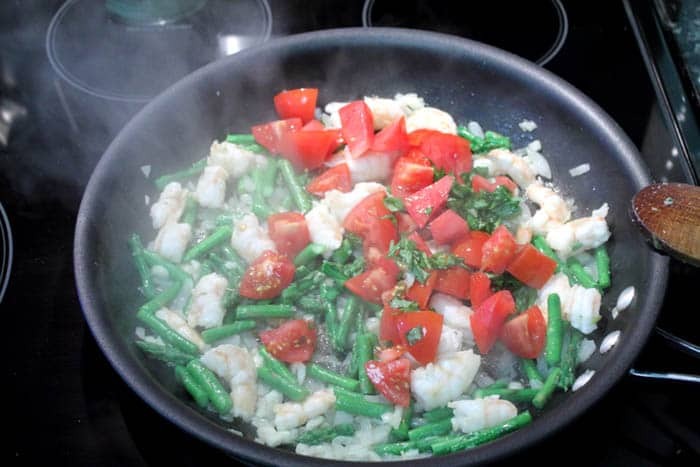 Toss in shrimp and asparagus and cook for 1-2 minutes per side depending on size of shrimp. Add tomatoes, white wine and squeeze of lemon juice and cook about 1 more minute just to warm tomatoes. Finish by adding basil, parmesan cheese and seasoning to taste. Stir. Serve over spaghetti squash. Garnish with a sprig of basil and a slice of lemon. Mmmm I love shrimp. 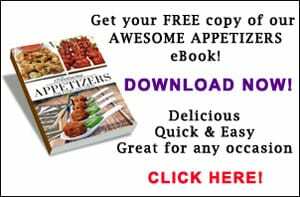 This is making me hungry! 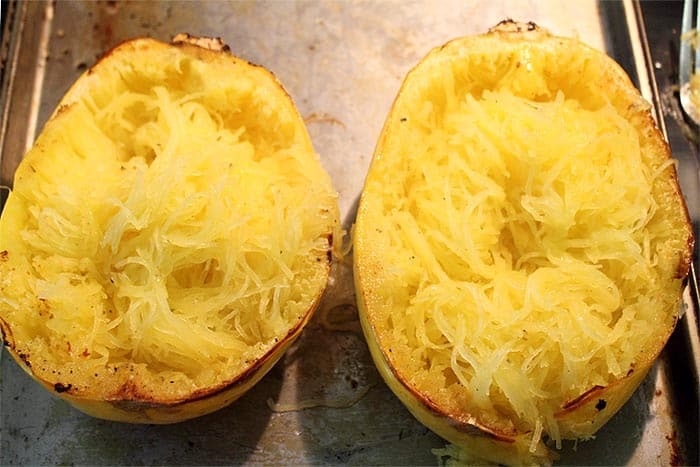 Great minds…..don’t you just love spaghetti squash? !